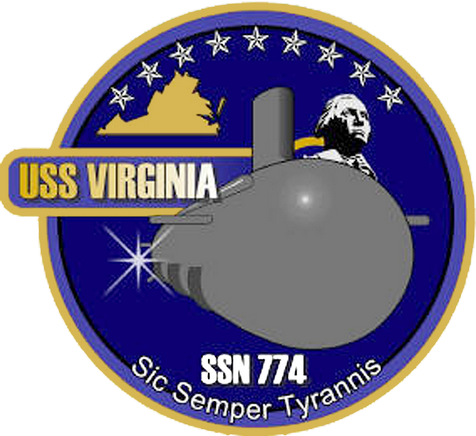 USS VIRGINIA (SSN-774) is prominently positioned. The forward view of VIRGINIA denotes her leading the Submarine Force into a new century and onto a new and exciting course for the United States Navy. The gold lettering and border around the seal combined with the blue background represent the Navy’s colors of blue and gold. The silhouette of the Commonwealth of Virginia represents the state for which the ship is named. Each of the nine stars represents an American warship named VIRGINIA. The single point of light at the stern of the ship symbolizes both the nuclear propulsion plant that powers the submarine as well as the ship’s data processing system fiber optic backbone. In keeping with the Commonwealth of Virginia’s motto, the words “Sic Semper Tyrannis” (Latin for “Thus Always To Tyrants”) appear at the bottom, which combined with the symbolism of the Commonwealth’s Seal, represents the triumph of Virtue over Tyranny. The image of George Washington also looks forward with VIRGINIA. George Washington, a Virginia native, has been characterized as the “indispensable man” vital to the formation of our republic. In all of history, few men who possessed unassailable power have used that power so selflessly and wisely for the welfare of their countrymen and all mankind. VIRGINIA also stands ready in all her indisputable power to serve the people of this great Nation and her allies. "Without a decisive naval force we can do nothing definitive, and with it, everything honorable and glorious."